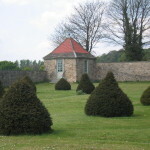 The Walled Gardens have had a mixed history, serving as a ornamental formal garden, a commercial nursery, and a bowling green. 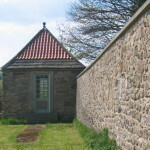 By 1776 the upper garden was fully enclosed with the stone wall to the north being particularly high to enable the cultivation of south facing fruit trees. It is interesting that there is no direct access between the upper gardens and the terrace below. The 19th Century brickwork suggests that there may have been railings to allow views of Shincliffe from the gardens. By 1857 the gardens had been levelled to form a bowling green. During the early part of the 20th Century they were used as a market garden before finally falling into complete disuse. Archaeological excavations were able to show the location of paths, flower beds and planting holes and even some of the types of plants that were grown from the analysis of pollen. Using this information along with a study of the horticultural publications of the time, it has been possible to restore the gardens to something resembling their appearance in the 18th Century. 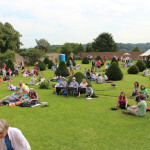 We intend to restore the walled garden to approximately 1720, the date at which the gardens were last known to be modernised by the Tempest family. 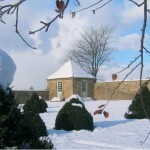 This will involved planting formal beds, and espaliering fruit trees to the walls. We will also leave space at either end for events.